Come and enjoy the only Lakeside getaway on Marco Island. Our 19-suite Marco Island Inn offers two two-bedroom suites, 10 one-bedroom suites and seven studio suites. Aloha! Welcome to Hotel Moloka'i, a genuine hideaway from all things mainstream. Located on the exotic beach of Kamiloloa and adjacent to Hawaii’s only barrier reef, you'll find our Polynesian village of bungalows replete with kitchenettes and Wi-Fi. Known as the birthplace of Hula and deemed the “Friendly Isle,” Hotel Moloka'i is just five minutes from the island’s largest city, Kaunakakai. We look forward to your stay! Are you tired of the same old corporate chain hotel experience? Hang out at Heavenly for a relaxing South Lake Tahoe vacation. Looking for a true romantic getaway experience in Lake Tahoe? Are you tired of staying in a hotel rooms next to boisterous kids? Secrets Inn is a couples only hotel meaning no pets, no kids, no noise...just until noon. Nestled along the tip of Cape Cod and minutes from downtown Provincetown sits the exquisite Sandbars Inn in the beautiful town of North Truro. Home to some of the Cape’s most breathtaking beaches, we're the ideal location for a peaceful beachfront New England vacation. Inn at Swan River is a peaceful retreat with 27 tasteful guest rooms located in the historic New England village of West Dennis in Cape Cod, Massachusetts. We are just minutes away from golf, tennis, fishing, bike trails and beautiful West Dennis Beach, a 1½-mile stretch of sandy beach on the relaxing waters of Nantucket Sound. The Inn at Deep Creek is perfect for any type of retreat—family vacations, romantic rendezvous, getaways with friends, or corporate retreats. Enjoy private suites with fireplaces, new beds, coffee in each room, complimentary Wi-Fi and more. Located steps from the free beach, boardwalk activities, and the convention center, Esplanade Suites features studio and one-bedroom, condo-style guest rooms in family friendly Wildwood, N.J. 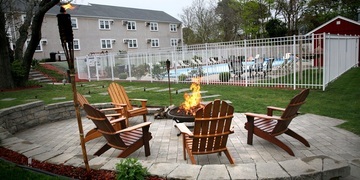 Outdoor heated pool, free parking, and barbequing await you! Esplanade Suites is the ideal locale for your summer getaway or vacation. 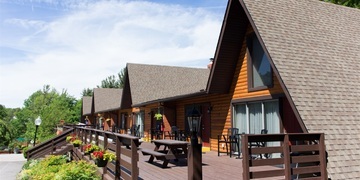 Experience an unforgettable escape in the heart of the Pocono Mountains at our all suite hotel nestled in Swiftwater, Pennsylvania. Take pleasure in a serene stay in one of our elegant cottages or suites complete with seating rooms, flat screen TVs, and kitchenettes. After an invigorating day of outdoor fun no matter what the season, come back to Woodfield and savor a unique and creative cuisine at our on-site restaurant, The Frogtown Chophouse - ranked #3 on TripAdvisor for top restaurants in the area.